How did chemistry and physics acquire their separate identities, and are they on their way to losing them again? 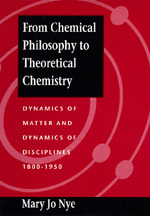 Mary Jo Nye has written a graceful account of the historical demarcation of chemistry from physics and subsequent reconvergences of the two, from Lavoisier and Dalton in the late eighteenth century to Robinson, Ingold, and Pauling in the mid-twentieth century. Using the notion of a disciplinary "identity" analogous to ethnic or national identity, Nye develops a theory of the nature of disciplinary structure and change. She discusses the distinctive character of chemical language and theories and the role of national styles and traditions in building a scientific discipline. Anyone interested in the history of scientific thought will enjoy pondering with her the question of whether chemists of the mid-twentieth century suspected chemical explanation had been reduced to physical laws, just as Newtonian mechanical philosophers had envisioned in the eighteenth century. Mary Jo Nye is George Lynn Cross Research Professor of the History of Science at the University of Oklahoma and author of Science in the Provinces (California, 1986), and Molecular Reality (1972).